Sherry Brescia's Blog: Fats are NOT bad for you! Fats are NOT bad for you! Clearly, fats are a necessary, life-enhancing nutrient. The real issue with fats lies in the type, the source and your intake. DON’T use margarine, spreads, or any type of polyunsaturated oil for cooking, as they are extremely sensitive to heat and form toxic lipid peroxides, carcinogens and mutagens when heated. Also avoid using shortening since it is made with hydrogenated oils which are a source of trans-fats. 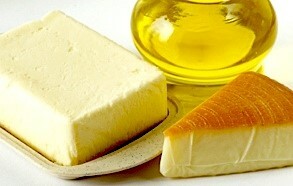 DO use butter, lard, tallow, chicken fat, bacon fat, coconut oil, palm oil, peanut oil and olive oil in cooking. DON’T buy products that contain hydrogenated or partially hydrogenated oils. Also avoid ALL margarine (even those marketed as “trans-fat free”) since polyunsaturated oils are heated when margarine is produced, and this creates harmful compounds similar to trans-fats. Also, avoid bakery products since shortening is commonly used in doughs and frostings. DO read food labels carefully. Choose organic varieties of packaged foods to help minimize harmful ingredients. DON’T swear off saturated fats like meat, eggs, cheese and butter, but don’t overdo it either. DO enjoy a variety of meats including beef, chicken, turkey, pork and bacon (look for organic, nitrate-free varieties), as well as eggs, cheese and butter. A reasonable serving size of meat is four ounces, or a piece about the size of the palm of your hand. Limit eggs to two per serving, and a sensible serving of cheese is one ounce. One to two teaspoons of butter on toast or vegetables is also fine. DON’T rely on fish like swordfish, shark, mackerel, tuna or farmed-raised salmon as sources of omega-3 essential fatty acids, as they have been shown to have high levels of contaminants including mercury and PCBs. DO get sources of omega-3 EFAs including wild salmon, walnuts, flaxseed and flaxseed oil. Supplement with a high quality fish oil formula to ensure your needs are met. DON’T assume that restaurants make healthy fat choices. Fast food restaurants are notorious for using polyunsaturated oils for frying their French fries, chicken strips, fish filets and other deep fried items, and even higher end restaurants commonly use polyunsaturated oils in cooking. DO ask questions of your server as to how the meals are prepared and request that your entrée be baked, broiled or sautéed in butter or olive oil. Any restaurant worthy of your business will accommodate your request. DON’T buy unsaturated oils that are packaged in clear glass or plastic containers, as they may be rancid. Oxygen, heat and light can all cause unsaturated oils to become rancid. DO buy unsaturated oils in dark (green or brown) containers. Store them in a dark cabinet or in the refrigerator, and recap them quickly and tightly after using. DON’T concentrate on one type of fat to the exclusion of all others. Your body needs saturated, monounsaturated and polyunsaturated fats. DO incorporate sources of all three healthy fats into your diet. About 30 percent of your daily calories should come from fats, including saturated, monounsaturated and polyunsaturated fats. This is easier than it seems. For example, for dinner you can have broiled salmon (a source of omega-3 polyunsaturated fat), green beans with butter and garlic (a source of saturated fat) and a tossed salad with homemade olive oil-based Italian dressing (a source of monounsaturated fat).